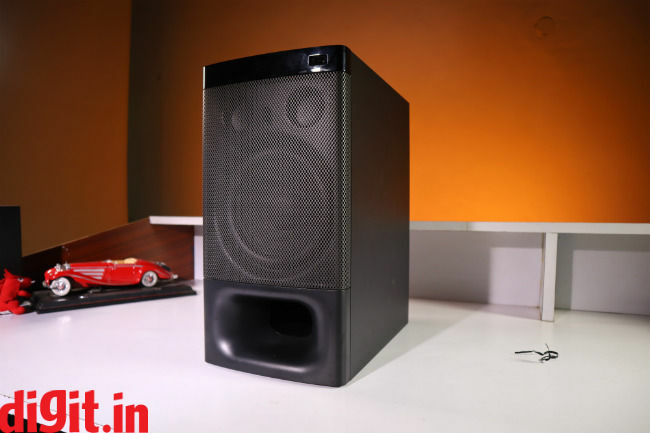 For about Rs 31,990 you get a well-built home theatre in a box that’s easy to set up with decent connectivity options. It will definitely enhance your TV viewing experience. However, its music performance may not appeal to audiophiles and the low front channel separation is noticeable. The lack of HDMI passthrough is missed. However, if you are new to the world of home theatres and are looking to invest in a simple convenient good sounding out of a box solution, then you can consider the Sony HT-S500RF. TVs are getting slimmer by the day and the biggest compromise is on sound quality coming from the built-in speaker. With the slim profile of most TVs today the best you get are two 10W down firing speakers. It’s safe to say that apart from watching news and some generic TV, most TVs today (especially budget TVs) don’t offer the audio experience you deserve when watching a blockbuster movie on your brand-new flat screen. To enhance your TVs sound capabilities, you have two options to choose from. 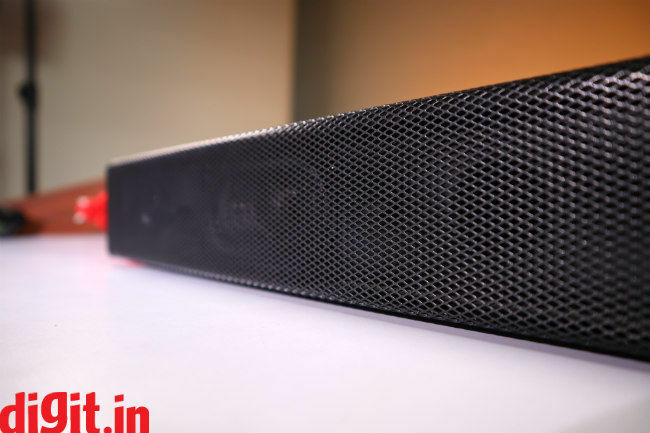 The first is a soundbar which will give you a good 2.1 channel experience. The second is a home theatre in a box which will not only enhance the sound from your TV, but also give you a surround sound experience. 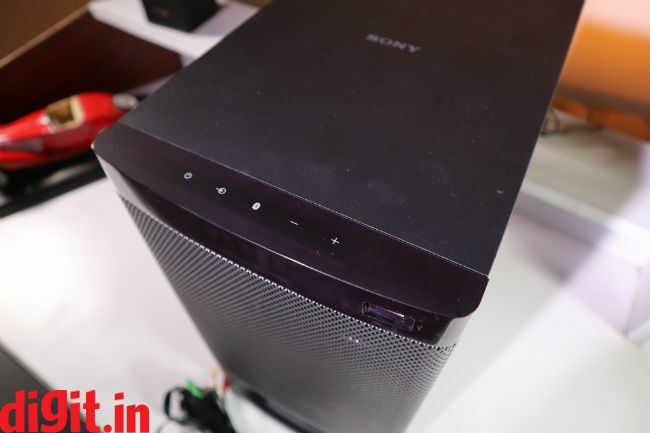 With a price tag of Rs 31,990 and a simple plug and play setup, is the Sony HT-S500RF a worthy home theatre in a box? A traditional 5.1 home theatre has 5 separate speakers representing each of the channels and one subwoofer. Sony has decided to integrate the front three channels in one soundbar that will sit flush below your TV. There are advantages and disadvantages to this design that we will highlight in the performance section but let’s start with the build. The soundbar is very well built. It has a metallic mesh grill covering the front protecting the drivers. You can see the drivers through the grill. At the bottom it has 8 rubber feet which give it good grip when kept on a table. You can also wall mount the soundbar if you like. A good thing about buying this system in India is that you can call a Sony technician to install the system for you ensuring you get a perfect setup for your room. There is no display on the soundbar. The display is on the subwoofer which we will get to in a bit. For aesthetic references, the soundbar is slightly smaller in length than the 50-inch TV that we have which means that if you have a behemoth of a TV, this soundbar may seem small. However, if you have a 43, 50 or 55-inch TV, you should be fine with this. 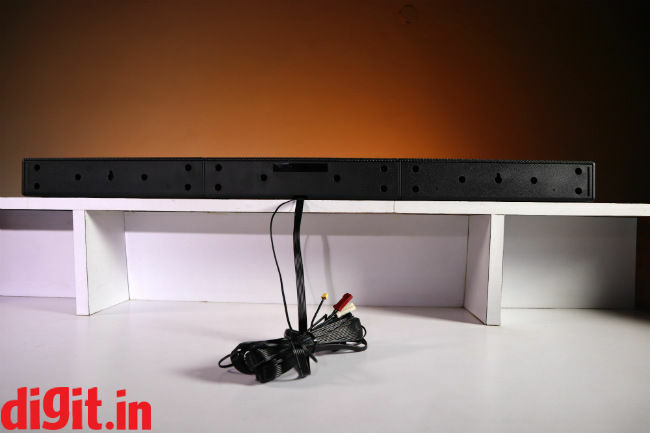 The cabling for the speakers isn’t detachable and it is integrated into the soundbar and the speakers. This is good because you don’t need to worry about connecting the cables correctly to each speaker. The downside is that if a cable gets cut, you can’t replace it sitting at home. The rear satellite speakers of the home theatre are small, and their build is ideal for those looking to wall mount the surround speakers. 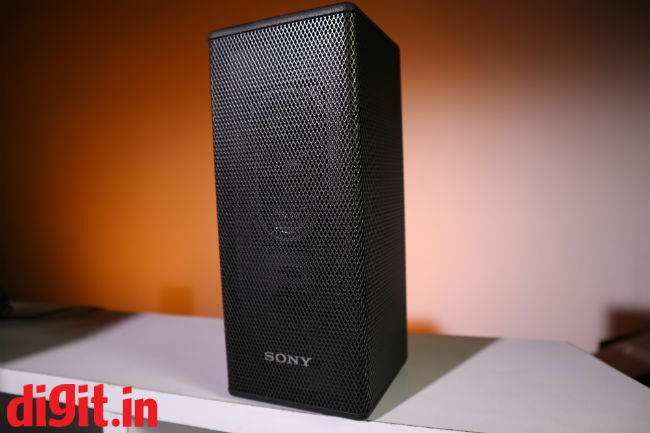 This system is the HT-S500RF priced at Rs 31,990 however, Sony has the HT-S700RF with floor standing surround speakers priced at Rs 39,990. 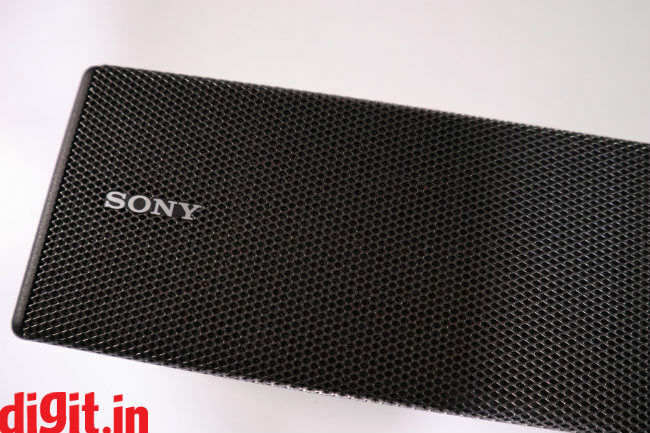 The rear satellite speakers of the S500RF have the same design as the front soundbar with the metal mesh grill upfront covering the drivers and the all black finish giving it a very minimalistic look. We set up the home theatre in two different living room setups and its aesthetics and design is minimal enough to blend in with the room and home entertainment setup. Moving to the subwoofer, this is the heart of the system. All the speakers’ connections convene at the back of the subwoofer and this is where the problem lies. Don’t get me wrong, the wires connected to the back of each speaker are generously long to fit more than the average living room size. 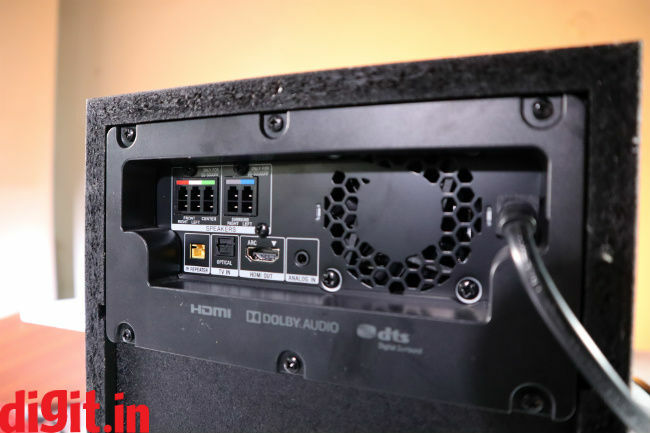 The thing is that the audio inputs like HDMI ARC optical audio, etc are all at the back of the subwoofer which means that you either need to place the subwoofer under/near your TV which may not be the ideal position, or you need to invest in a really long HDMI or audio cable. We did the latter as the position of the sub under the TV wasn’t working for us. We wish the connectivity options were at the back of the soundbar for ease of setup. 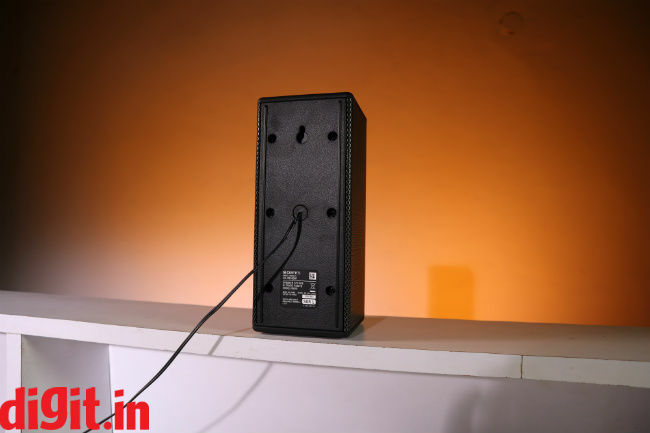 The subwoofer also houses an LED display which will show you information such as input along with information about the sources and the ability to customize the dB levels of the speakers. It’s simple and convenient to use and doesn’t house the complexities of a dedicated amplifier. The subwoofer is also NFC enabled making it easy to pair your smartphone to it. The physical controls rest on top of the subwoofer and are touch sensitive. Overall the build of the home theatre is very good. It is minimalistic without any jazzy design which ensures it blends well with almost all TV setups. When it comes to connectivity, the home theatre has optical-audio input, Analogue audio input (stereo mini) and USB type A. It also has HDMI ARC (Audio Return Channel), however there is no HDMI input for passthrough which is a bummer. This means that if you use HDMI to connect the speakers to your TV, then you are losing out on a port of the TV. Setting up the home theatre is as easy as dialling Sony’s helpline number and waiting for an engineer to turn up and install it for you. Just remember, the rear surround speakers should be at ear height and facing you to get the best possible experience from the system. Cable management may be an issue for some, but this is where the length of the bundled cables is helpful. There is an HDMI cable in the box of the system which is nice, however the length can be a problem if you don’t want to keep the sub below the TV. 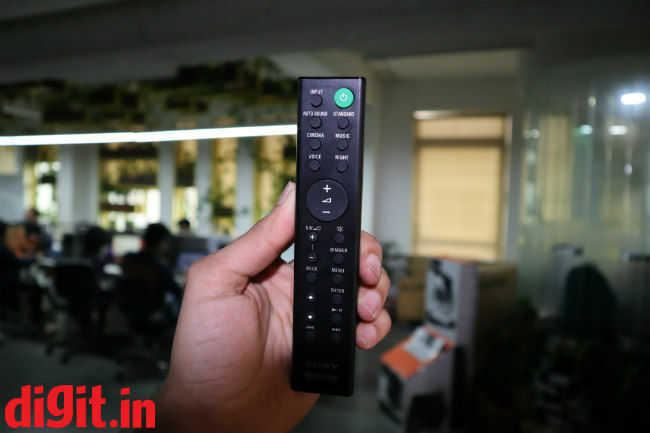 Coming to the remote control, it is made of plastic, feels minimalistic and is ergonomic. It is lightweight, and buttons are rubbery making them easy to press. The power and source buttons are right at the top making them easiest to reach. The remote gives you access to a bunch of features such as auto sound, subwoofer level controls, sound modes, playback controls and more. There is also a Dimmer button which dims the display on the sub for a more immersive viewing experience. The remote is simple and easy to use and when we paired the system with a TV using HDMI ARC; all the basic volume and playback controls were usable through the TVs remote control. To test the performance of the HT-S500RF, I have broken it up into music, movies and gaming. Wherever possible I have tried to listen to the same audio through different connectivity options of the speaker to give you a perspective as to which is the best source to use. I primarily played music from Apple Music and YouTube on a smartphone and connected it to the speaker via Bluetooth. I played some Poets of the Fall, Charlie Puth, Pink Floyd, Wake Me Up by Avicii, and more. 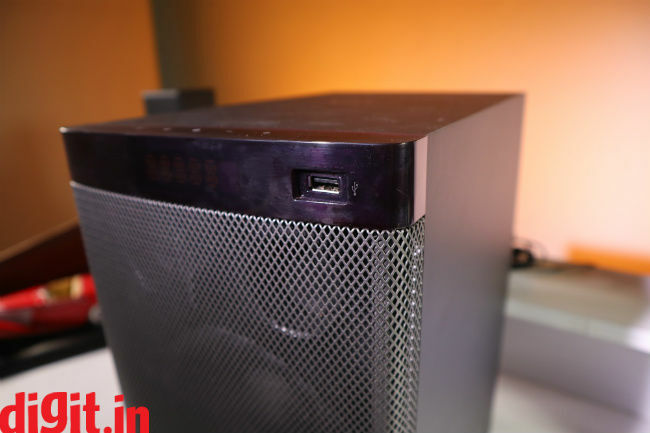 One thing to note is that the system can deliver good bass and the audio comes from the surround speakers as well as the front left and right, giving you quite a holistic sound. You can control the level of bass via the remote control and keeping the system at music settings (found on the remote) gave the best output. Clarity of instruments can be an issue and if you set up the home theatre in a small room, then the audio doesn’t sound great. You will need to set it up in a living room to truly enjoy it. Ideally the size of the room should be about 15 feet wide and 20 feet long to enjoy the home theatre experience. If you are an audiophile, you are better off investing in a good pair of studio monitors at the same price. However, for the average joe looking for a multipurpose system, this one can get the job done. I connected the Home theatre to a TV via HDMI ARC and saw a bunch of movies/TV shows from Netflix, Hotstar and Prime Videos. I saw some of the same content by streaming the audio via Bluetooth. The Bluetooth audio was sent via the Fire Tv stick to the system. One thing is clear, if the source of your content doesn’t have good audio, it will reflect on the speaker. Also, between Bluetooth and ARC, I recommend using ARC as it delivered the best of all the content from the TV. Watching movies from Netflix and Prime Videos, the audio seemed crisper and the channel separation is better when compared to Bluetooth. Here is something to consider. The dialogue in a movie is expected to come from the centre channel unless it is being spoken from an angle. Front left should have the sound coming from the front left speaker, surround right for the sound coming from behind you on the right, so on and so forth. 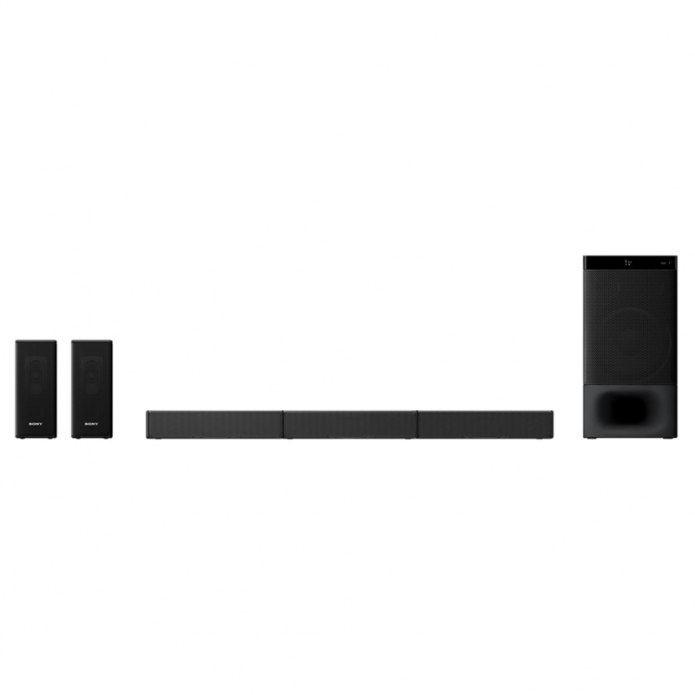 Now, these attributes are a part of the Sony HT-S500RF home theatre with some caveats. Firstly, the left and right speakers are too close to the centre channel as a part of the ergonomic design of the system. This makes a plane flying across the screen give less of a channel separation dramatic effect when compared to front speakers that are far apart. Secondly, the rear surround speaker of the respective side (left or right) also kicks in when the front left or right speaker is meant to produce a sound. 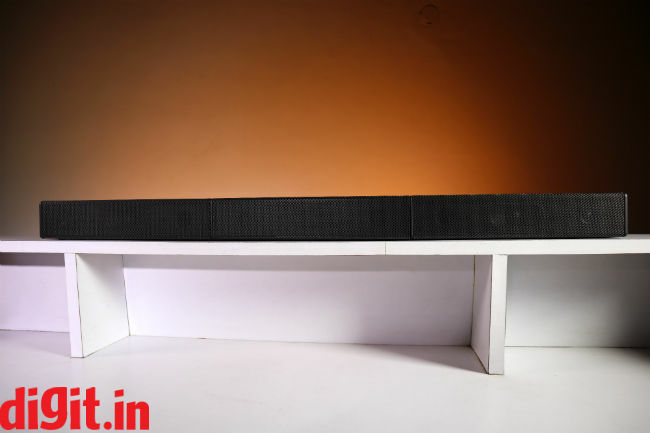 This could be to compensate for the lack of distance between the left, right and centre channel but it is something that you will notice if you are a home theatre enthusiast. For the rest of you (and I asked this to the people experiencing the system with me) it gave a more pronounced presence of the surround speakers of the home theatre. This isn’t necessarily a pro or a con but something I noticed when watching movies and playing games. A good thing is you can control the dB level of the surround speakers and the sub to get the umph you want. The overall movie performance is good with action sequences coming to life and quitter moments delivering pronounced dialogues. The movie A Quiet Place is a good example to get a great surround experience. When it comes to gaming, I played some games on the Xbox One X and the PS4 Pro and the experience was a lot of fun especially if you enjoy playing shooter games or action adventure games like Uncharted or Gears of War where you have bullets flying all around you. A real test for the system was a game like Hellblade Senua’s Sacrifice where the audio should literally surround you and it worked quite well on this system. From the bang of guns to the tanks and planes in Battlefield 1, to the swish of Spider-Man’s web, you can enjoy these speakers for gaming. Again, it felt like the surround speakers were overcompensating to make up for the lack of space between the front left and right channels, but it isn’t something that should bother the average joe. Overall, the gaming performance is good with dialogue, nats and gunfire, but I wish the front channel separation were better. If you are in the market to get a home theatre in a box for about 30 to 35k, there are a bunch of options to choose from. You have some from Yamaha, Onkyo, Panasonic, Samsung, Philips, Logitech and more. In the case of the Sony HT-S500RF it has a few things going for it. It is well built, has a plug and play formula, and for watching movies, TV shows and gaming will be a good addition to your flat screen TV. However, the lack of HDMI pass through is dearly missed and the fact that all the connection options are at the back of the sub, means that placement can get restrictive. Like us, you can invest in a really long HDMI cable to exploit positioning of the sub. The key thing to consider is the size of your room. If it is a bedroom or a small living room, then a home theatre can be an overkill. You can do good by getting a soundbar. However, if you have the space and are about to venture into the world of home theatres and don’t want to build a custom one, and are looking for an out of box solution as your first system, then yes, you can consider it.